Brooklyn Borough President Eric Adams (right) said at a Bedford-Stuyvesant town hall meeting Thursday that he did not agree with the mayor's plan that would bring 90 new homeless shelters throughout the city. BEDFORD-STUYVESANT — Mayor Bill de Blasio faced questions and criticism Thursday over his plan to open 90 new homeless shelters throughout the city, including dissent from Brooklyn Borough President Eric Adams. 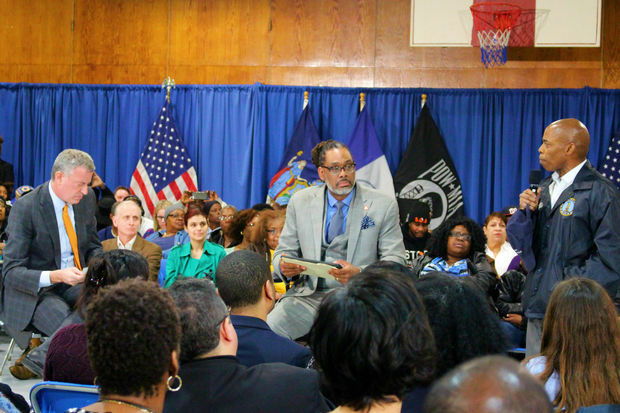 “I don’t agree with the plan as it’s laid out for several reasons, and the mayor is a friend and ally, but those who know me know I’m candid in my analysis,” Adams said at de Blasio’s town hall in Bedford-Stuyvesant. Thursday’s town hall at P.S 23 on Willoughby Avenue comes a week after the mayor announced his plan to open more shelters and shutter 360 cluster sites. The administration looks to cut the 60,000-plus homeless population by 2,500 over the next five years. Bed-Stuy’s Community District 3 comes in second in the borough for the most number of shelters with 23 buildings, according to city figures. Locals recently tried to halt plans for a proposed drop-in center on Bedford Avenue, saying the neighborhood has too many. Adams echoed the sentiment Thursday, saying the community has been “oversaturated” with homeless shelters. “I don’t agree with the mayor’s plan, all of it, but it is a plan,” the borough president said. Still, Adams called on the community to address the issue. De Blasio thanked Adams for his work and followed up by outlining his strategy to combat homelessness across the city. The mayor's plan calls for a “community-based” approach, where homeless individuals will be able to stay in their own neighborhoods. “We believe the best chance of someone getting their life turned around, getting back on their feet, is if they’re near to family, near their friends, near their house of worship,” de Blasio told attendees Thursday. He was pushed on the plan by locals, including a homeless mother who said she was moved from The Bronx to Brooklyn, was unable to find housing with a city voucher and lived in a shelter riddled with mice with her two children and husband. Others worried about services for the homeless population already in the area, saying that men from a nearby shelter are often seen roaming public housing buildings during the day. One woman stressed empathy for individuals going through tough times, but pressed de Blasio on the timing of his plan. “You said this has to be done and this will be done in the next three to four years. I need to say, welcome to Bedford-Stuyvesant — and I want to say, what took you so long? Why now versus the last three-and-a-half years?” she asked. “It took us the three years to break through and figure out what we could do differently,” the mayor answered. De Blasio added that he would like a “family-based model” to play a larger part in solving the city’s homeless crisis, with financial resources given to relatives to help homeless individuals.